German lawmakers wanted to learn more details about the persecution of Falun Gong (also known as Falun Dafa) in China before the 35th European Union-China Human Rights Dialogue. 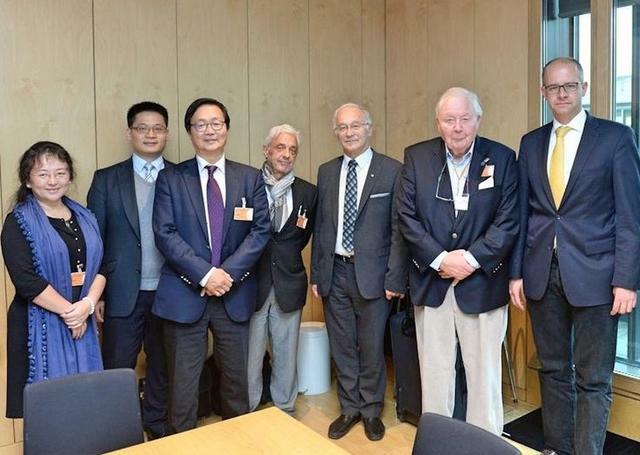 Two members of the Bundestag of Germany, Michael Brand and Martin Patzelt, invited the Falun Dafa Association and other human rights organizations for a dialogue on Monday, October 17, 2016. As the chair of the Committee on Human Rights and Humanitarian Aid, Michael Brand has been concerned about the human rights violations in China for a long time. After he turned down the Chinese embassy's requests to take down articles about Chinese human rights issues on his website, his visa application for a trip to China was rejected in May 2016. During Monday’s dialogue with the human rights activists, Brand brought up the new results of a collaborative investigation on forced organ harvesting in China, conducted by Canadian human rights lawyer David Matas, former diplomat David Kilgour, and American journalist Ethan Gutmann. He believes that there are more hidden crimes behind the organ transplants in China that are yet to be revealed. Patzelt said that although Germany and China may collaborate on business, the German government should not sell its soul for profit. He pointed out that the governments of Israel and Spain have already passed laws to forbid “organ tourism,” where people go to China to secure an illegally obtained organ for transplant. In his opinion, the German government should follow suit. Patzelt noted that Falun Gong practitioners think for themselves, and that the Chinese Communist Party knows that it can’t control a spiritual group, and launched the persecution of Falun Gong out of fear. He said that only dictators are afraid of people who think for themselves. Zhou Lei, chair of the German Falun Dafa Association, briefed the lawmakers on the facts of the persecution. She highlighted the huge number of Falun Gong practitioners who have disappeared, very likely victims of the state-sanctioned organ harvesting. Manyan Ng and Hubert Koerper, board members from the International Society for Human Rights in Germany, told the lawmakers that their organization informed the German government about the forced organ harvesting in China ten years ago. They pointed out that Chinese hospitals conduct 60,000 to 100,000 organ transplants every year, a number that far exceeds the number of true organ donors. They reminded the lawmakers that the U.S. Congress and the European Parliament recently passed resolutions demanding that the Chinese government stop this practice. The EU Parliament also called for a thorough investigation into this issue. The International Society for Human Rights called upon the German government to comply with the EU resolution and ban “organ tourism” to China. Falun Gong practitioner Ding Lebin talked about the lawsuits against former Chinese head Jiang Zemin which have been filed by more than 200,000 victims of the persecution. Ding told the attendees that Wang Yu, a Chinese lawyer and Ludovic Trarieux International Human Rights Prize winner in 2016, who has spoken up on behalf of persecuted Falun Gong practitioners, was taken away by police in July 2015, and has been imprisoned ever since. Ding also mentioned Zhang Zanning, another human rights lawyer and a law professor, who has been suppressed by the government for defending Falun Gong practitioners. Two lawmakers said that given the considerable amount of evidence, they had no doubt about the existence of forced organ harvesting in China and will urge the German government and Bundestag to take actions to stop this crime.